reverse to the sol state once they react and become a gel. – They have advantages and disadvantages similar to those of reversible hydrocolloid materials because both types of materials are predominantly water. – Alginate materials are not as accurate as reversible hydrocolloid materials, but they are much easier to use. 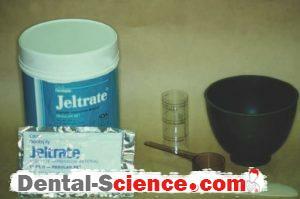 – Alginate materials are supplied as powders that are mixed with water. 1. – The powder contains potassium alginate. – It is a carbohydrate polymer that dissolves in water, forming a sol. 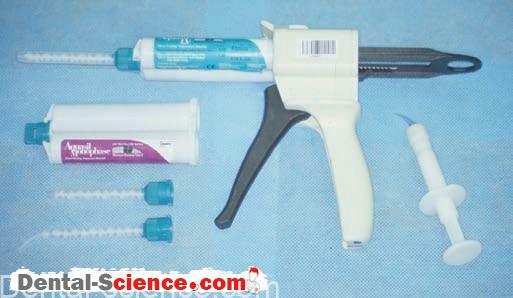 – The reaction is similar to that of polycarboxylate and glass ionomer cements. – Potassium alginate is derived from algae. – The filler gives the mixed material “body,” which allows acceptable handling. – Without filler, the mixed material would be too runny for use. reaction (calcium sulfate), the retarder for working time (sodium phosphate), colorants, and flavor. 4. 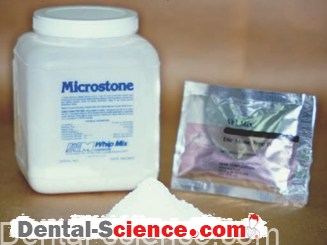 – Some alginate products have antimicrobial agents added to the powder. manufacturer more than to disinfect the impression after it has been taken. 5. – Both reversible and irreversible hydrocolloid materials are predominantly water. – Thus, several advantages and disadvantages result when their use is compared with that of other impression materials. – Reversible and irreversible hydrocolloid will wet a tooth surface that is contaminated by oral fluids. 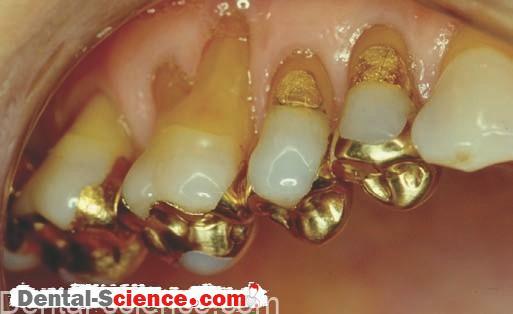 – Fewer air bubbles are trapped between the tooth and the impression material. – Hydrocolloid materials will even absorb a limited amount of oral fluids. soda pop and fruit juice used to make punch. pouring the impression with gypsum products is easier than with elastomeric impression materials. of the impression material, which is predominantly water. – Hydrocolloid impression materials are quite hydrophilic, but the same cannot be said for all impression materials. – The disadvantage of the material being predominantly water is that water evaporates from the surface of the impression if it is left exposed to air. – When the water evaporates, the impression shrinks and is no longer accurate. – To prevent evaporation of water from hydrocolloids (alginate and reversible hydrocolloid), impressions should be poured as soon as possible after disinfecting. – Hydrocolloid materials contract slightly after setting and exude water. – This process is called syneresis. – Syneresis occurs very slowly, but it is a second reason to pour hydrocolloid impressions as soon as possible. – When disinfecting a hydrocolloid impression, however, it is important to limit the time that the impression is exposed to an aqueous disinfecting solution. – The hydrocolloid will absorb water, swell, and distort. – This is called imbibition. 1. Working time is provided by a competing reaction that initially delays cross-linking. When the powder is mixed with water, the alginate powder dissolves, as does the calcium sulfate and sodium phosphate. 2. Initially, the calcium ions react with the phosphate ions and precipitate out of solution. 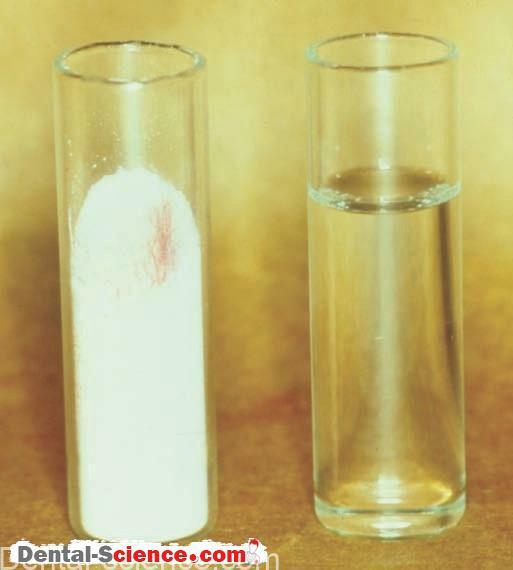 The calcium ions do not react with the dissolved alginate until all the phosphate ions have reacted. The set material is a hydrogel that is composed mainly of water. The alginate powder tends to settle in bulk containers during shipment and storage. Before opening a new bulk container, the material should be “fluffed” by shaking or turning the container upside down and right side up for about a minute. This will remix the heavier components with the lighter ones, resulting in the proper amount of material in each scoop. 2. 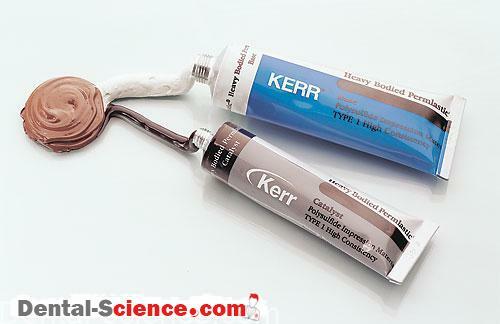 The filler in most Alginate Impression materials is a silicate material. Silicate dust causes lung problems if inhaled. Additives have been included in some alginate products to reduce the dust that occurs when alginate is used; these products are called dustless alginates. Regardless, it is not healthy to breathe any dust. A mask, as commonly worn when treating patients, will reduce exposure to alginate dust. If one is unhappy with the consistency of the mixed material, the solution is to change brands. Do not alter the water/powder ratio to make the mix thicker or thinner. 4. The temperature of the water controls the rate of the setting reaction. Warmer water increases the setting rate, and cooler water slows the setting reaction. Alginate is supplied by most manufacturers in regular-set and fast-set varieties. Regular-set materials gel in 3 to 4 minutes, whereas fast-set materials gel in 1 to 2 minutes. 5. Mixing the alginate material is an aggressive aerobic activity. First, the powder and water are gently stirred together. For better spatulation, the mixing spatula should have a curved side that follows the curve of the mixing bowl. Aggressive spatulation continues until a smooth creamy mix is obtained. The typical mixing time is 1 minute. The mixed alginate material is scooped from the mixing bowl with the spatula, placed in the tray and seated in the patient’s mouth. 6. Regardless of the setting time of the alginate material, removal of the impression is delayed for 2 to 3 minutes after gelation. Strength and elasticity improve during this additional setting time. The impression is removed with a quick motion. 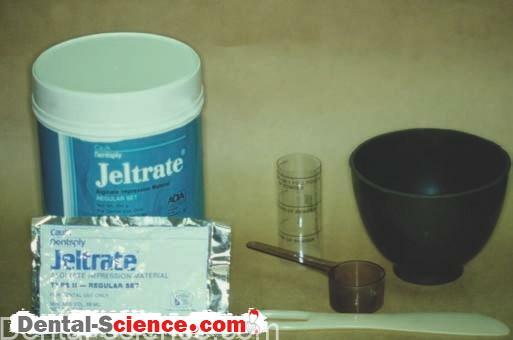 Alginate tends to be stronger when it is stressed quickly. Removing impressions slowly can increase distortion and tearing, whether the material is a hydrocolloid or an elastomer. 7. 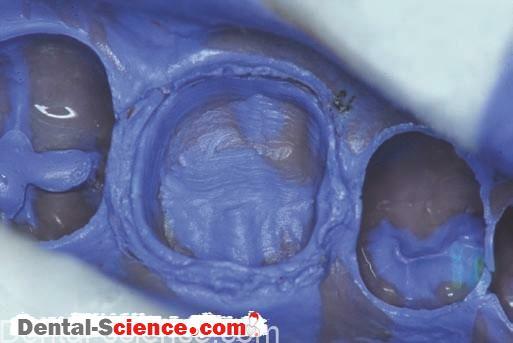 As with irreversible hydrocolloid materials, alginate impressions must be disinfected and poured with care. Gain or loss of water (evaporation, syneresis, or imbibition) will affect the accuracy of the resulting cast. disinfectant, sealed in a plastic bag and poured as soon as possible. No satisfactory method exists to store hydrocolloid materials for more than 30 minutes. 8. 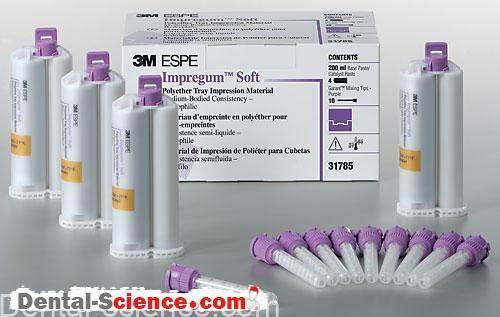 Alginate impression material is used for a variety of purposes. 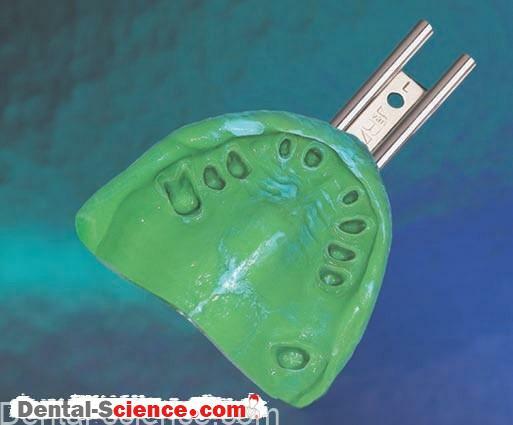 It is inexpensive and easy to use but lacks the accuracy for precisely fitting restorations. fabricate mouth guards and bleaching and fluoride trays.